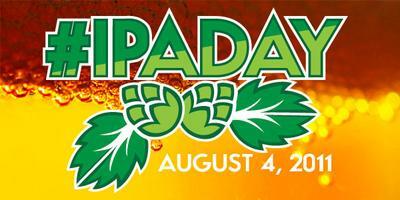 Not that we need another excuse to drink craft beer, but tomorrow, August 4th is International #IPADay. It’s the world’s largest celebration of craft beer and you’ve been ordered to join in on the fun! According to @TheBeerWench and @RyanARoss, the day’s founders, International #IPADay is a grassroots movement created to unite the voices of craft beer enthusiasts, bloggers, and brewers worldwide, using social media as the common arena for connecting the conversation together. You can join in the fun by checking in to events on and offline. Participate online by sharing your photos, videos, blog posts, tasting notes, recipes, thoughts on Twitter, Facebook, YouTube, WordPress, RateBeer, Foursquare, Gowalla, Yelp, Untappd or just about any other social media platforms you use to communicate with your friends. Use the hastag #IPADay in all of your posts and then see what others are saying by searching the hashtag on google, twitter or other social media resources. I know that I’ll participate by drinking an extra hoppy IPA and share it with my friends online, what about you?